At LMU’s Center for Advanced Studies, political scientist Bernhard Zangl and his colleague Andreas Kruck are studying how international organizations adjust to shifts in the global balance of power. Donald Trump has attacked international organizations with a vehemence unmatched by his postwar predecessors in office. 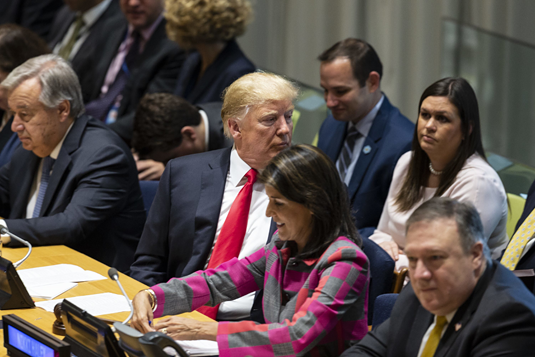 When the world’s leading power repudiates multilateral agreements and withdraws from international institutions, what impact is it likely to have? Zangl: It constitutes a serious threat to the global order. International institutions are normally maintained by the most powerful countries. The global order we have known since the end of the Second World War was created and sustained by the US. It is especially alarming when the world’s most powerful nation indicates that it would rather destroy than preserve that structure. It signals to other states that they need not take the rules seriously. That’s very different from a declaration by Liechtenstein that it no longer intends to play by the rules. The current world order was already under pressure, as emerging powers, such as China, India or Brazil, have long been clamoring for more influence in international organizations. Strategic conflicts classically develop when rising powers challenge the existing order, and thus the reigning hegemon. Researchers call this a power transition. At present, China or India is trying to alter the global order to its own advantage, not to destroy it. Amazingly, that order is now under greater threat from the US. In this sense, Trump’s approach is new, and is already having notable consequences. Processes of change and disintegration are now unfolding at a faster pace than before. So President Trump is acting as a catalyst. Precisely. Trump seems to be dissatisfied not so much with individual organizations but with the international order as such. The US previously withdrew from specific organizations during Ronald Reagan’s presidency. What we are seeing now is much broader. The World Trade Organization (WTO), the North American Free Trade Agreement (NAFTA), the treaty on Intermediate-Range Nuclear Forces (INF) and the Paris Agreement on Climate Change – all are now at risk. The United Nations has always been a target for criticism. It’s not clear whether this is a passing phase that will be over in another two years. But expressions of dissatisfaction with the world order are nothing new in the USA, no matter who happened to be in the White House. Recent decades have seen significant shifts in the global economy. China has become a world power. To what extent can Trump’s reaction be seen as an indication that the USA is now under pressure? It is always difficult for a dominant power that has long been able to dictate the rules of international relations to deal with emerging powers that cannot easily be integrated into its own projects. The US wants to ensure that its position does not deteriorate further. That’s the basic reason why the country now carefully calculates whether membership of the International Monetary Fund (IMF) still makes sense, or is of relatively greater benefit to China or the EU. From the USA’s point of view, the latter have a further negative impact on the balance of power. And relative gains concerns play an ever larger role, when the competition is snapping at one’s heels. China is also becoming more powerful militarily. What effects has this had so far? Generally speaking, we see no imminent signs of serious change in the military balance. But, here too, things are changing. The threatened withdrawal of the USA from the INF treaty is aimed not only at Russia. It also has to do with China. These are the sorts of dynamic shifts that you are now examining in a new Research Group at the Center for Advanced Studies. Yes, the Research Group will look at the existing global order from the perspective of the rising nations, most of which want to change the established order and its institutions. Their efforts have had some success. In the IMF, China and the USA agreed on a compromise that gives China more voting rights and hence a bigger say in the organization. In other areas, such as the allocation of seats on the UN Security Council, there has been no movement. India, Brazil, Germany and Japan would very much welcome permanent membership. If the UN Security Council were set up today, these States would probably have permanent seats – and presumably the right of veto. But the allocation of seats agreed in 1945 persists. Our Research Group will analyze the conditions that have allowed, or not allowed, the global order to adapt successfully to a change in the balance of power. We want to identify the factors that promote or hinder a peaceful transition. You will also explore the roles of hard and soft power. Of course! For whether or not international institutions adapt depends not only on the challengers’ hard power, but also on their deployment of soft power. “Soft power” refers to the ability to project a positive image which is convincing enough to be an attractive force. In 1945, the US not only had the most effective military machine and the world’s largest economy – it had an exceedingly attractive culture to offer. And large numbers of people in post-war Europe wanted to live like Americans, Hollywood films and American popular music had a huge impact. And just as the capacity to threaten confers power, so too does the ability to exert an attraction on others. Hard power is tangible power, based on military force and/or economic might. Hard power puts one in a stronger negotiating position. How do emerging or rising economies exercise hard power in practice? Here’s one example. During the dispute over the governance of the IMF, China indirectly threatened to sell its stock of US Treasury bonds, with which the US finances its national debt. China has bought large amounts of US bonds, and particularly during the financial crisis of 2008, the US became dependent on China to a certain extent. That is why both sides were willing to agree on a compromise, and China obtained more voting rights at the IMF. And how do they go about applying soft power? Take the dispute at the WTO in relation to the drugs used to treat AIDS, which pitted the West against Brazil and India. Formally, the dispute was about intellectual property rights. The active agents in these drugs were protected by patents, and patients in developing countries could not afford them. Brazil and India wanted to produce generic copies, and their major argument was that lack of cheap alternatives condemned poor AIDS sufferers to death. How did the West react? The US threatened to bring a case against Brazil and India at the WTO, but the latter were unimpressed and continued to produce their generics. The attempt to initiate judicial proceedings developed into a PR disaster for the US, because the public – even the American public – accepted the argument advanced by Brazil and India. The public at large rejected the idea that patent rights should take precedence over human health. The USA was forced to withdraw its complaint – and soft power won a clear victory. In the end, the clause relating to the protection of intellectual property in the WTO’s rules was itself altered. Manufacture of generic drugs in the emerging economies in the Southern hemisphere is now legal, under certain conditions. Together with visiting scholars at CAS, you are now working on power transition theories (PTTs). The PTTs so far proposed assume that an established dominant power will be replaced by a rising power within a certain period of time, usually as a result of war. We believe that such a process is currently unlikely. Today’s rising powers want change, not a different kind of world order. Your own research focuses on interstate negotiations. Is soft power playing an increasingly important role in this context? International politics has undergone drastic changes. States no longer negotiate behind closed doors. Now, non-governmental organizations (NGOs) are often involved as well. Rising powers exploit the public sphere so as to exert rhetorical pressure. They present arguments which are not intended to persuade their opposite numbers, but to mobilize the public to force them to accept those arguments. What sorts of negotiating strategies have you identified? There are essentially three basic approaches. The first is ‘power bargaining’, where both sides deploy the threat of hard power. Then there is the use of arguments to apply rhetorical pressure – the WTO negotiations on intellectual property and AIDS drugs are a case in point. The third mode of negotiation is strategic cooptation. Here, the established powers realize that they need help to preserve the prevailing order. So they offer their challengers institutional privileges. One example is the recognition of India as the world’s sixth nuclear power in return for its agreement to abide by the Nuclear Non-Proliferation Treaty. And what determines the choice of one or other style of negotiation? Rising powers intent on achieving fundamental change are likely to opt for power bargaining and rhetorical pressure. On the other hand, if they essentially accept the legitimacy of the existing institutions, we would expect them to choose the strategic cooptation model. If they also possess soft power, they should be more likely to bet on the efficacy of rhetorical pressure rather than power bargaining. We believe that the existing conditions in the institutions concerned are the major factor in deciding which mode of negotiation is selected. Is it possible to predict the outcome of negotiations on the basis of these theories? Generally speaking, theories in the social sciences cannot be expected to yield hard-and-fast predictions. We can offer explanations, but not forecasts. In contrast to theories in the hard sciences, the social sciences must contend with human protagonists. They will make use of persuasive explanatory theories with a view to optimizing their own actions. So the theories themselves have an impact on the actions that the individual actor decides to take. That’s why theories in the social sciences can become either self-fulfilling or self-negating prophecies. Can particular negotiating strategies be interpreted as a kind of psychological profile of the country concerned? Well, the USA was for a long time a well-meaning hegemon. It took the views of other countries into account in its decisions relating to the global order. That’s why we have international institutions. Most of them were set up on the initiative of the US after1945. With the advent of Trump, it seems clear that the USA no longer wishes to play this role. It now sees it as “a bad deal”. As a benevolent dominant power, the US tried to make the cake bigger for all. Now the country wants a bigger slice of what’s on the plate for itself. That’s what ‘America first’ means. So Trump is upsetting everything? Indeed – even our project, to a certain extent. Our original plan was to observe the behavior of the challengers over a longer period of time. The basic assumption was that the dominant power has an interest in maintaining the established order, while the lesser powers wish to change it. But now the US is itself upsetting the applecart. And that’s a development we need to get an analytical grip on. What makes the Research Group format, as practiced at CAS, particularly appropriate for tackling a topic like this? It enables us to get a conversation going between two hitherto separate fields of research. Very often, our colleagues who focus on global shifts in power relations have little expertise in the field of institutional change, while those of us who study the evolution of institutions seldom relate changes in that sphere to changes in the global balance of power. Our Research Group is intended to motivate specialists in institutional change to apply their expert knowledge in the context of power shifts. So I invited experts on institutional change to consider the impact of alterations in the global power structure on specific international institutions. We held a conference together a few days ago, and formed a collaborative group. Unlike Trump our aim is to form multilateral, rather than bilateral, contacts. Prof. Dr. Bernhard Zangl holds the Chair of Political Sciences with a Focus on Global Governance and Public Policy at LMU’s Scholl Institute. Each year, two Research Groups embark on new projects at CAS. In addition to Bernhard Zangl’s “Power Shifts and Institutional Change in International Institutions”, an international team assembled by LMU geoscientist Donald B. Dingwell is already exploring the topic “Magma to Tephra: Ash in the Earth System” in a project that centers on experimental volcanology. This interdisciplinary group is studying the effects of volcanic activity on the Earth’s surface. More specifically, it focuses on the complex reactions that occur between magma and volatile gases over the entire life cycle of volcanic ash – from its emergence into the atmosphere as the result of volcanic activity originating in the lithosphere through to its uptake by the biosphere and the anthroposphere. During the academic year 2019/2020, Professor Barbara Ercolano’s Research Group on “”The Ionisation Structure of Planet-Forming Discs and their Atmospheres”, which will study aspects of planet formation. In his project, Professor Klaus H. Goetz of LMU’s Scholl Institute for Political Sciences will tackles a highly topical issue in his project on “Exceptional Political Dynamics: Temporality, Turbulence, Transformation”.